Two things that I enjoy are writing for the web and making money. That’s why I’m always looking for ways to make money through my writing. I recently started working with INTENTclick, a company that helps me easily make money from my content, which allows me more time to focus on my writing while continually earning. INTENTclick is a system that was created primarily for content writers who use content writing as a means for promoting and selling products online. Essentially, this system takes and uses a series of words within your existing content and turns them into highly monetized links without affecting the SEO value of the content. These links are dynamically created as the page is loaded and upon mouse over on one of these links, a small pop-up window containing an advertisement appears. What are the Advantages of Using INTENTclick? INTENTclick offers 70% revenue sharing and guaranteed $5 CPM for the first month. They aim at publishers within the “make money online” and “save money online” fields and by targeting these vertical markets, are able to offer publishers a much higher payout than advertisers in the same field. Site Content must focus mainly on Better Income or Save Money. You must have at least 1,000 US users per month. Your site is a focused web affiliate business with high ratio of SEO traffic. Getting started with INTENTclick is easy and requires nothing more than a simple sign-up. Once registered, you simply add the code to your site and watch as double-underlined links are automatically added to the pages containing relevant content. 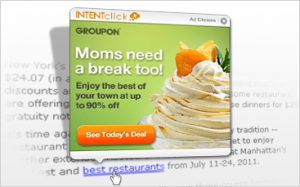 INTENTclick offers all their publishers 70% revenue share. INTENTclick code can also be used in addition to your Google AdSense code without having to worry about clashing code. It’s easy to make money online with this system. Then sign up for free with INTENTclick today and put it to the test yourself. We also have a 100% free E-book available that offers a more in-depth understanding of INTENTclick and can be found at INTENTCLICK book.com or Content Monetization Book.